Sorrelle is the Service Development Manager for Coventry Libraries and a member of the Reading Well book selection panel. She’s written about her experiences delivering Reading Well in libraries. Libraries are all about stories. Shelves upon shelves of books fill our spaces and our minds with tales of love, magic, and intrigue. But having worked in libraries for many years I truly believe the most powerful stories of all are the real life stories of the people we come in to contact with every day. A few years ago when I was at a Library doing a public consultation, an elderly lady approached me, she held my hand and told me her story, and this is the story I want to share with you today. For the purpose of this blog I’m going to call her Jassi. Jassi had lost her husband 5 years previously. Her grief had brought on depression which meant she was largely unable to connect with the world, and for the most part she felt her life was over. She rarely ventured outside of her home, but a couple of times a week she had to make the short journey to a nearby supermarket where she would buy bread and milk. It was when making her usual shopping trip one day that Jassi noticed there was a library nearby. Hoping to escape the rain while she waited for her bus home, she took a chance and decided to go in. Jassi sat quietly and read a newspaper alone. Her visit was short but for Jassi it sparked something important. The following week she returned, and soon visiting the library had become a small part of her routine. 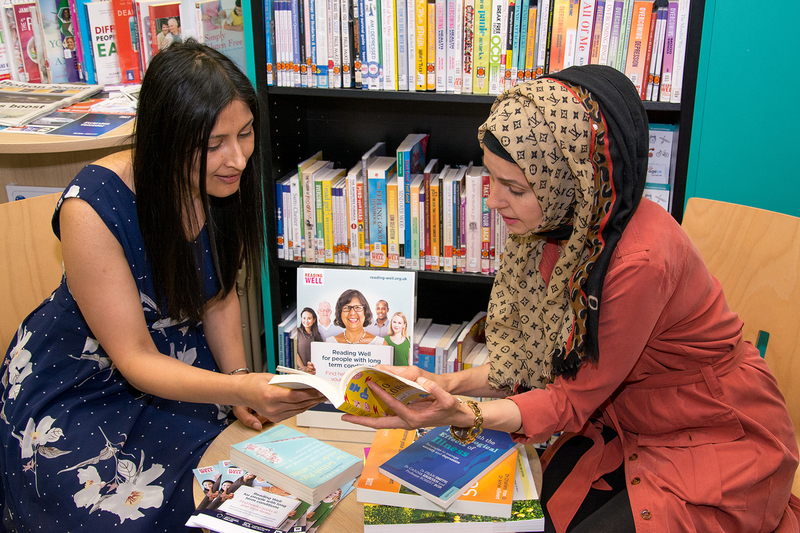 Over the weeks that followed the library staff gently encouraged Jassi to look at the self-help books available from Reading Well and to come along to the Libraries friendship group. As Jassi spoke to me she held my hand tightly and explained that to her the library had become a lifeline. The books had helped her self-confidence and she had made lots of new friends through groups there. Most importantly she told me for her life was now worth living again Jassi’s is just one story, but I think it makes an important point. For Jassi the Reading Well resources were a form of support that she could access at a time that felt right for her in a place she had come to trust. I’ve always been hugely impressed by the Reading Well schemes. To me the really special thing about the collections is that they act as a broker between libraries and health professionals. In Coventry we have a launch for every new collection, and we find this is a great way of involving local partner organisations and voluntary groups to share the benefits of Reading Well and increase referrals to the collections. You can imagine then how excited I felt to recently have the opportunity to represent the Public Libraries Health Group and be involved in the process of selecting titles for the upcoming new common mental health conditions list. It was with a feeling of great privilege that I eagerly joined the first planning meeting earlier this month. I wasn’t 100% sure of what to expect but as colleagues from Mind, The Royal College of Nursing and other organisation joined the discussions I knew it would be a productive meeting. The Reading Agency steered the path forward as experts in the field debated the latest advice and recommendations. There was an amazing sense of collaboration as all the professionals and organisations involved were committed to working hard to produce a book list that would genuinely help and support a wide range of people. I left this first session feeling really blown away by the amount of work and effort that goes into developing the list, and looking forward to the meetings still to come. My experience of the planning meeting really confirmed to me all that I already believed about the importance of these collections. The books in Reading Well collections speak a language that is trusted by health professionals, yet because libraries are neutral spaces that are open to all, anyone is able to pop in and choose a title to help them or a loved one. Sometimes people will present their prescriptions, but I think what most people really like is the anonymity of the scheme. Crucially because the Reading Agency provide a national platform and reach, these collections are easily deliverable by libraries, and therefore accessible to the members of the public they were designed to support. This story is of the magic of libraries. It’s what motivates me to keep looking for ways that we can reach more people. This is something that really does matter. It’s something that can change people’s lives in the most real and powerful ways, and if you are ever in any doubt about that, just remember Jassi‘s story.